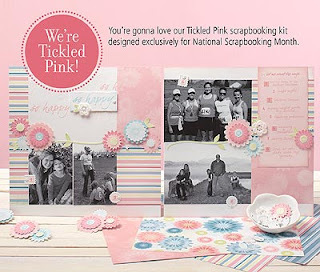 You’re gonna love our Tickled Pink scrapbooking kit designed exclusively for National Scrapbooking Month in May. Get a jump start and order your kit with my next order going off on Friday, April 17 (this will be my only gathering order for the month of April). My next order will be sent off May 4 in order to get items back in time for the National Scrapbook Day Event. PUT A LITTLE MORE “YOU” IN YOUR SCRAPBOOKS AND YOU’LL BE Tickled Pink this spring! Our newest scrapbooking kit puts you front and center—with everything you need to create two beautiful two-page layouts all about the things that you love and that make you shine. And speaking of shine, you’ll also be tickled by the kiss of glitter on these fabulous papers! • Sign up as a new Consultant between May 1-May 31 and receive a kit FREE. • Host a Home Gathering between April 15-May 31 with minimum sales of $400 and receive a kit FREE. Celebrate spring, bling, and everything you love—you’ll be so happy, you’ll be Tickled Pink! all of these added up comes to... $33.40...which means for just $1.55 more, you get all the papers, the die-cuts, and the full-color instruction booklet including NEW patterns!!! And...if you have a wish list of stamps that you've been wanting, then when you purchase $60 in stamps, you get the Tickled Pink FREE! Plus the SOTM for only $11.48 more! This is a deal you simply can't pass up! Order the Tickled Pink kit and attend an exclusive workshop FREE to put the pages together along with additional papercrafts created with the "scraps".